I first began searching for information about the origin of Otis, Inc. when I was writing about the company for my website in 2011. The only authoritative published information – Dorothy Rainwater’s American Jewelry Manufacturers – referenced the company’s earliest listing in the 1943 edition of Trade-Marks of the Jewelry and Kindred Trades. Based on that information, other sources assumed that this maker opened that year, but the style of the Otis sterling bracelets and other pieces in my boutique suggested an earlier beginning. So I kept searching. I have taken over the plant, lines, patents, etc., of what was formerly Wachenheimer Bros., Inc., retaining the plant and personnel at 36 Garnet St. The corporation is a Rhode Island corporation and will continue to make a fine line of sterling silver whitestone, real stone and marcasite jewelry and at a later time develop new ideas and material. We hope to build the business up to its former prestige and, generally speaking, make the finest type of well-styled and high-quality merchandise at a medium price. Our selling policy will be direct to the high-grade retailers and department stores at one and the same price. Correspondence with the Rhode Island Office of the Secretary of State confirmed that Otis, Inc. incorporated on November 13, 1934. We don’t know exactly when the company opened its doors, as the local newspaper did not announce the re-employment of Wachenheimer Brothers’ personnel at a time when the area’s unemployment rate in the jewelry industry was extremely high. Finding the connection between Otis and Wachenheimer Brothers (“WB”) didn’t surprise me. 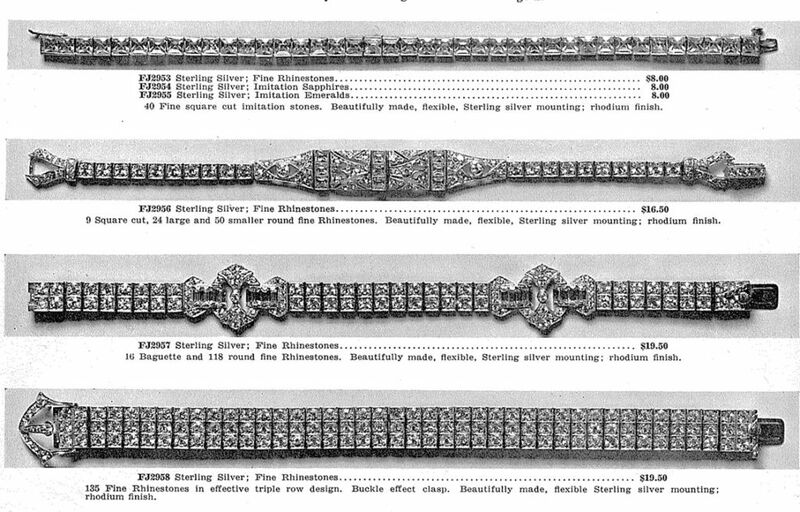 I had already observed the use of the same jeweled fold-over clasp in the last ads for the latter’s sterling silver flexible bracelets (published in 1933-1934) as the clasp used by the Otis pieces in my collection. I assumed that WB had moved to a less-expensive clasp than their traditional tongue-in-groove style for cost-savings. Every Otis bracelet I had seen had that fold-over clasp. Case closed. But I was wrong. When my first WB article was published in the May 2013 issue of Adornment: The Magazine of Jewelry & Related Arts, I received an e-mail from Robin Deutsch, complimenting my work. I was flattered, as I’d heard of Robin and admired her own tenacious and meticulous research. Somehow the “conversation” turned to Otis. I told her what I had found, and she revealed that she had figured out their connection to WB many years earlier. As a collector of both companies’ jewelry since the late 1990s, Robin had made a number of observations that led to this conclusion. She had noticed the similarities between many of the pieces produced by the two companies and the “3 20 17” patent date on many of the Otis bracelets she owned. (That patent is described below.) 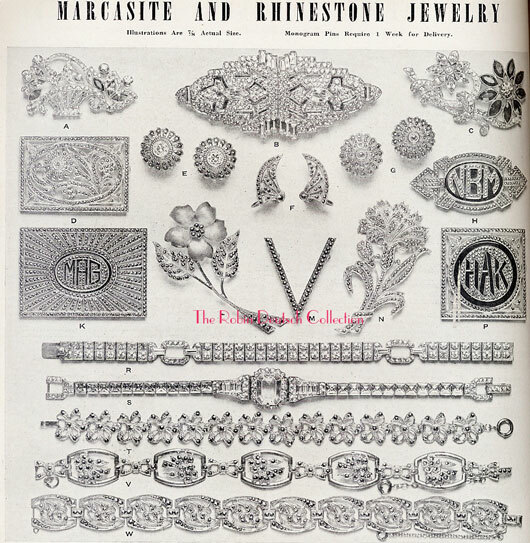 When she found pictures of some of her pieces in wholesale jeweler catalogs from the 1940s, she knew that jewelry could not have been produced by WB – the 1934 edition of The Keystone Jewelry Trade Mark Book listed the company as “out of business”. In addition, she found a 1942 listing of Otis, Inc. at 36 Garnet Street in Providence, the same address as WB. Then around 2007, she saw a sterling silver, onyx and marcasite bracelet on eBay that had been double-struck with both makers’ marks, and her case was made. The back of the large cabochon center stone was stamped “Otis Sterling”, and the clasp, “Wachenheimer Sterling”. The style of the bracelet was from WB’s Real Stone Jewelry line that first appeared in 1929. So we decided to pool our information and collaborate on this article. Although Otis made brooches, earrings, necklaces, and bracelets, we decided to focus on the last. We recently got together to examine many pieces in Robin’s collection. Based on that meeting, our research findings, and several lengthy phone discussions, we’re ready to share with you our observations on this company, whose output we both like. The “3 20 17” patent date referenced above refers to U.S. patent number 1,219,683. It was issued to Harry Wachenheimer and Ernest L. Davis, and assigned to WB on March 20, 1917. The patent can be seen here. It defined a new way of constructing a “chain” that did not require solder and that had a series of links that could be easily and quickly attached to or removed from the chain. This method of manufacture was one of the two ways in which WB made their flexible bracelets, perhaps their best-known product type. This construction is illustrated in fig. 1, which shows the front and back of two bracelets of similar design. Both have a jeweled fold-over clasp. The top piece is signed “Otis”; the bottom, “Wachenheimer”. By the time this WB bracelet was produced, the company was using its “Wachenheimer” trademark instead of “Diamonbar”. Fig. 1. Otis & WB bracelets with WB’s 3-20-17 patented construction. Courtesy of TruFaux Jewels. On June 22, 1920, Harry was granted a patent for an “improved flexible bracelet”, to be constructed of a series of units which could be connected by side-bearing flanges and which would each form a “box setting for gems”. That patent can be seen here. This construction is illustrated in these three bracelets from my boutique, shown in fig. 2. The top piece is a variation of the design of the other two. The first and second bracelets are signed “Otis” on the back of the clasp; the third is signed “Wachenheimer” on the triangular end-link. Robin has a bracelet just like this WB piece; hers has all clear rhinestones but no maker’s mark. It is shown in fig. 5. Fig. 2. Otis & WB bracelets with WB’s 1920 patented construction. Courtesy of TruFaux Jewels. One of the features of WB’s Diamonbar bracelets is their tongue-in-groove clasp: the tongue looks like a curved loop connected to a plain release button on the top end. Some bracelets have a swivel safety-catch that was notched to fit around the release button, as shown in the picture on the left side of fig. 3. We have identified a second type of tongue-in-groove clasp that WB used towards the end of their production, before they changed to the fold-over style. This more complex clasp is shown on the right. It has a flat, rectangular tongue with a floral-decorated release button in the center, above the edge of the last link, and a straight safety-clasp that swivels. (This floral-topped button is the same finding Otis used on the screw-backs of their earrings.) Like the jeweled fold-over clasp, both types of tongue-in-groove clasps can be found on WB and Otis bracelets. Fig. 3. Two types of tongue-in-groove clasps. Courtesy of TruFaux Jewels. Unlike WB, Otis didn’t advertise in consumer publications such as Vogue and Harper’s Bazaar, or in trade publications. The company didn’t place multi-page, full-color ads in wholesale jewelers’ catalogs, also unlike WB. However, Otis pieces were shown in the catalogs of some wholesale and mail-order jewelers but without attribution. We think that manufacturers provided some of their jewelry unmarked so that each retailer could use their own boxes signed with their store’s name. This page from the 1937 catalog of a New York City wholesaler (fig. 4) shows four bracelets that we believe are by Otis, based on the similarity of their designs to Diamonbar bracelets advertised by WB 10 years earlier. The first one has the original WB tongue-in-groove clasp. The second, which Robin and I both own, is marked “Otis” on the fold-over clasp. 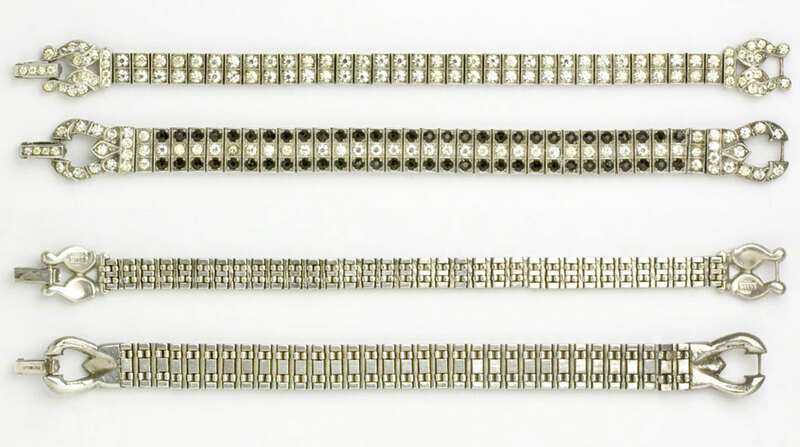 The third and fourth bracelets have the more complex WB tongue-in-groove clasp. The catalog describes these pieces as “Sterling silver mounting; rhodium finish”, which means they were made after the early 1930s, when the rhodium-plating process was introduced. Fig. 4. Catalog of L. & C. Mayers Co., 1937. Fig. 5 shows the second bracelet from the same 1937 catalog along with an Otis version of the onyx WB line bracelet from fig. 2. The extra clasp in the center of the line bracelet (which, in this case, is unsigned) allows it to be attached to another piece with a fold-over clasp to form a necklace, as shown. Fig. 5. Courtesy of Robin Deutsch. This page from the 1941 catalog of the same wholesaler (fig. 6) shows a bracelet that is in Robin’s collection. It is an example of how the company augmented an existing design – in this case, the center elements from the bracelet in fig. 5 were made into an entire bracelet. 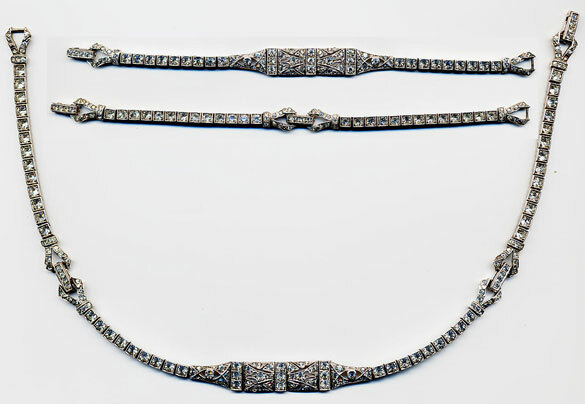 The only difference is that the connecting links in the 1937 piece had round stones, while those in the 1941 bracelet had square-cut stones. This piece also had a rhodium-finish. Fig. 6. Catalog of L. & C. Mayers Co., 1941. Fig. 7 shows an example from the 1943 catalog of the same wholesaler. Robin has the top bracelet (labeled “R”). Hers is stamped “Sterling” and the “3 20 17” patent date, but has no maker’s mark. This piece has the second, more sophisticated tongue-in-groove clasp. The design is nearly identical to Diamonbar bracelets that appeared in ads produced by WB for wholesaler catalogs in 1926-1927. The second bracelet on the page shown here (labeled “S”) is definitely by Otis, based on its clasp and design, and its similarity to another bracelet in Robin’s collection. Fig. 7. Catalog of L. & C. Mayers Co., 1943. Probably in the 1940s, Otis produced new designs with curved centerpieces added to the WB “chain”. Its construction, which was based on the ease of attaching or removing the links, must have facilitated this design evolution. Here are four examples from Robin’s collection. The last photo shows the back of the fourth bracelet and how easily the centerpiece could be added. These pieces are all rhodium-plated. The plating is peeling on the back of the clasp of the last bracelet. Fig. 8. Otis 1940s bracelets. Courtesy of Robin Deutsch. All WB pieces sold by them were marked with one of their trademarks (Diamonbar or Wachenheimer). The company’s ad in the May 1934 issue of The Jewelers’ Circular – Keystone states: “For the protection of the retailer and his customer, ALL WACHENHEIMER jewelry is clearly stamped and guaranteed”. Unlike most manufacturers who sold through wholesalers, WB’s pieces were always identified. The company placed full-color ads for their jewelry in wholesaler catalogs, with their Diamonbar trademark on each page. See my CJCI article “Diamonbar Bracelets & the Men Who Made Them” for examples. 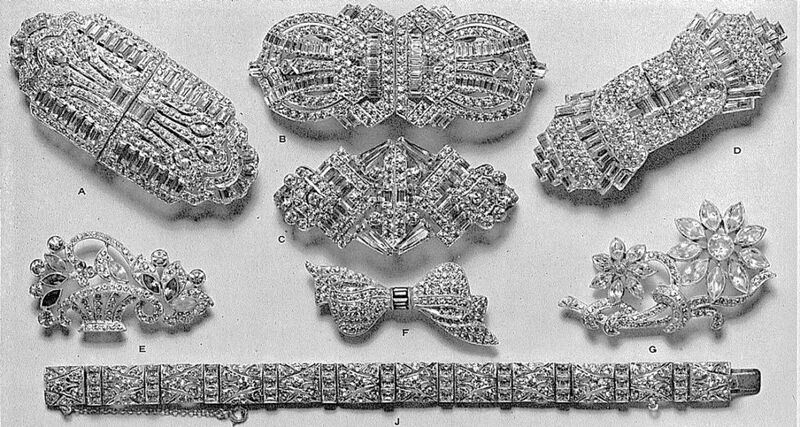 When Edward O. Otis took over the premises on the 4th floor of 36 Garnet Street, he must have acquired a significant inventory of WB “chain” with high-table rhinestones (and/or the components for making it), jeweled fold-over clasps that were marked only “Sterling”, and tongue-in-groove clasps that were stamped “Sterling” and the “3 20 17” patent date. Because this patent expired in 1934, we assume that any components with this mark would have been produced before that date. We believe that pieces with only these marks (i.e., without the Diamonbar or Wachenheimer trademarks) were sold by Otis. 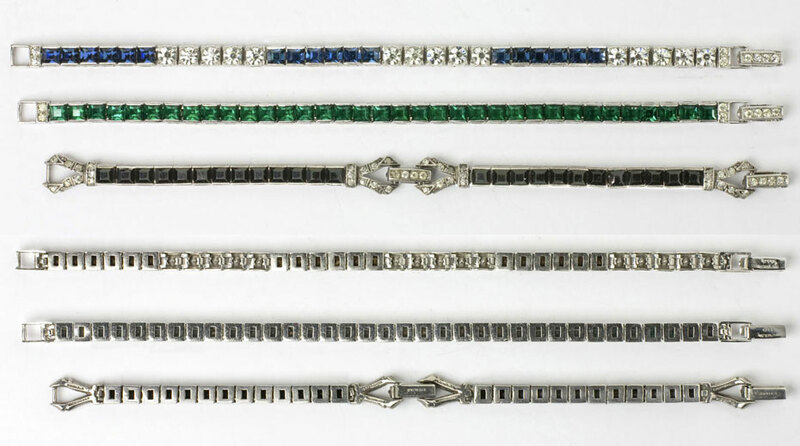 WB pieces with fold-over clasps were signed “Wachenheimer” on the triangular end-link of the bracelet and “Sterling” on the back of the clasp. On Otis pieces with this clasp, “Otis” and “Sterling” were stamped on the back of the clasp. The date of a catalog isn’t necessarily an indication of when a piece of jewelry shown in it was made. 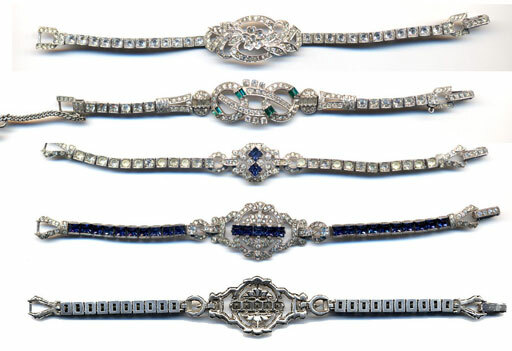 Bracelets with a rhodium-plated finish were produced after the early 1930s. Otis jewelry was sold by wholesalers and mail-order companies in addition to L. & C. Mayers. We have seen Otis pieces in other companies’ catalogs. Our review of additional catalogs and pieces in Robin’s collection indicated that Otis continued to sell WB-based designs as late as 1949, but the workmanship is not as refined as the pieces produced by Wachenheimer Brothers. Although the 1934 press release announced Otis’ resignation from that association to start his own costume jewelry company, he did, in fact, remain with the NEMJSA until 1948. In the 1930s, he helped the industry improve business practices and regain profitability during the Great Depression. During World War II, he advocated for raw materials when government restrictions on metals were imposed. Throughout his tenure with the association, he was a well-respected government liaison and industry spokesperson. By the time the company closed in 1970, it was operating under the name Otis Co., Inc., at 1199 Eddy Street in Providence. Barbara Schwartz is a costume jewelry historian and a tenacious and passionate researcher. She is also the founder of TruFaux Jewels, an online boutique of exquisite costume jewelry made in Europe and North America from the 1920s – 1950s. She is a member of the Association for the Study of Jewelry and Related Arts and the Vintage Fashion Guild (VFG). Barbara has lectured on fashion and jewelry history for the Association of Image Consultants International, at two conventions of Costume Jewelry Collectors International (CJCI), as part of the Jewelry History Series at The Original Miami Antique Show, and at The Antique Jewelry & Art Conference. Her articles have been published online by CJCI, Kovels, and Sixty and Me, and in The VFG News and ADORNMENT: The Magazine of Jewelry & Related Arts. Her own interesting story has also been featured on The Story Exchange.